The 66-year-old lives in Grand Forks but joins Keith Johnson annually in his cattle drive, bringing Johnson’s 400 cows back home near Sharon, ND. Johnson invites family, friends and strangers to come to his farm and participate in the cattle drive. Brown has been coming for 25 years. “I’ve never missed a one,” Brown said. Many participants wore chaps, packer boots and, most importantly, hats and gloves. Just like real cowboys, those participating in the cattle drive faced the elements. The biting wind and snow brought the temperature outside to 15 degrees. Despite the weather, everyone showed up at Johnson’s barn at 8:30 a.m. and drove to the pasture about 20 miles away. The cattle seemed eager to get home, taking off at a trot just after 10:30 a.m.
Once the group gets going, the thumping sound of cow and horse hooves can be heard before the animals are seen through the snow. “Hey, cow!” riders call when one steps out of line. And when a cow goes rogue, two or maybe three horses chase it back into the herd. The line shows the melding of cowboy history with the cowboys of the present. Johnson’s grandchildren dart around the cattle in ATVs and the back of the line is made up of a parade of trailers, trucks and SUVs. The whole line of cows, horses and trailers behind them stretches almost a quarter mile long. “I call this ‘organized chaos,’” Johnson said of the drive. Casey Wollangk and his mom, Sara Ollman, have been coming to Johnson’s cattle drive since Wollangk was about 12 years old, he said. He’s now 30. Wollangk missed a few years when he went to college and then veterinary school, but has started attending regularly again. In the four years the sisters have been coming to Johnson’s cattle drive, they have gotten to give the cows their vaccines, tag their ears and even insert an IUD into the cows, Anderson said. “We don’t have to bring anything, we just bring food and sometimes we even get yelled at for that,” Koppy said. The sisters, like the other participants, come for the experience of the cattle drive. It is likely one of the largest of its kind in the state, Johnson said. 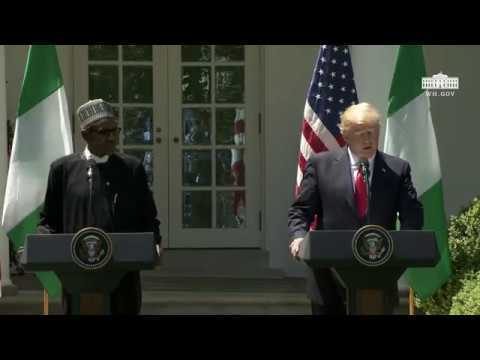 What to make of the car crash Trump-Buhari presser?